The Reserva Natural Palmari is a jungle lodge and research facility located on the Brazilian side of the lower Río Javarí, the geographical border between Peru and Brazil. It opened in 1998 and can now be considered the leading eco-tourism operator in the region. The Reserva Natural Palmarí consits of 40 hectares of nearly primary rain forest, but activities of the lodge are carried out over a much larger area on both sides of the Javarí. Depending on the water level of the river, the Reserva Natural Palmari Lodge is reached in 3-5 hours by boat from Leticia/Tabatinga. The lodge offers good food and accommodation, friendly and knowledgeable staff and a range of activities. As a place for birdwatching, the area is still more or less unknown to the international birding community. Hopefully that will change with this report, because the Javarí really deserves to get on the ornithological map of prime destinations in Amazonia. As far as birding is concerned I hope that this report will answer most of your questions, but you´re welcome to ask me about anything that´s unclear or lacking. For information on prices, services and everything else you might want to know about the lodge and its surroundings, please visit the lodge´s homepage at www.palmari.org. The lodge is ideally situated. Virtually all habitats of the lower Javarí are found in its immediate surroundings, most importantly the terra firme. As Javarí is a strongly meandering river the flood plain is often several kilometers wide, and direct access to terra firme is only found in a few places. The forests are more or less pristine, although selective logging has been taken place in several areas. The extraction of Rosewood 50 years ago have left logging tracks (made by tractors) that are slightly visible even today. Cleared areas are only found close to settlements. Terra firme Forest on solid ground that is never flooded. This is the most species rich forest, but also the most “hard-worked”. The terra firme near Palmarí is quite hilly, with small streams and marshes in between and an understorey rich in palms and heliconias. Várzea The várzea is the typical forest of the Javarí flood plain. Much of it is flooded every year for several months, but the highest parts don´t get flooded every year. These high parts have a transitional-type forest and can be found i.e. at Santa Rita. The flood plain has many channels and oxbow lakes, most of them with “blackwater” character. The dark color of the water comes from the tannins that leek from the leaves of the forest floor. Igapó This forest type is found mainly along blackwater channels and lakes, to a lesser extent along the river. It is a low forest of rather uniform height at the edge of the várzea that is flooded most of the year. Riverine habitats River banks and beaches are normally present for 5 months every year. These are important for breeding turtles, iguanas and birds. At low water a “peninsula” is created just in front of the lodge, with muddy shores and vegetation reminding of a river island. Little similar habitat is found along the lower Javarí. The lower Río Javarí is home to more than 500 species of birds, creating an unusual mix of avian elements from western and southern Amazonia, with even a few species present that are generally found only north of the Amazon river. Several species are difficult or even impossible to see elsewhere in Brazil or Peru, making the area attractive also for serious country listers. The Río Javarí has been relatively little visited by ornithologists, and only in recent years has the terra firme become better known, resulting in the discovery of at least two new species for science. Pending the official publishing of these two species, which will likely be within the next two years, the only information I can give is that both are cryptic species, best told apart by their vocalizations and that one of them is an “Antbird”. The Gray Wren is perhaps the area´s foremost speciality, but the list of sought-after species is long. Among those can be mentioned Zigzag Heron, Crested and Harpy Eagles (the latter seen rather frequently! ), Buckley´s Forest-Falcon, Starred Wood-Quail, Wattled Curassow (rare nowadays), Red-crowned Parakeet, Scarlet-shouldered Parrotlet, Red-billed Ground-Cuckoo (at least by rumor), White-chested Swift, Fiery Topaz, Gould´s Jewelfront, Pavonine Quetzal, Purplish Jacamar, Brown-banded, Collared and Cestnut-capped Puffbirds, Curl-crested Araçari, Orange-fronted Plushcrown, Bar-bellied, Ocellated and Zimmer´s Woodcreepers, Undulated Antshrike, Río Suno and Chestnut-shouldered Antwrens, Black-tailed, Slate-colored, Dot-backed and Hairy-crested Antbirds, Black-spotted and Reddish-winged Bare-eyes, Chestnut-belted Gnateater, Johannes´s Tody-Tyrant, Brownish Twistwing, Amazonian Royal-Flycatcher, Amazonian Black-Tyrant, Citron-bellied Attila, Striped and Flame-crested Manakins, Purple-throated Cotinga, Amazonian Umbrellabird, White-bellied Dacnis and Band-tailed Oropendola. For a birder, the best time to visit Palmarí is between June and September (probably also October), when it´s dry season and the water level has dropped significantly (peak time is late August-September) and the várzea is dry. Keep in mind, though, that some channels leading to the various blackwater lakes may be impassible at very low water levels (=September). Visiting Palmarí at other seasons could yield interesting and surprising discoveries. Rainforest birds move around a lot more than one might think! Intra-Amazonian migration is very poorly known, and relative abundance of many species depends on water levels, availability of fruiting and flowering trees and even unknown factors. There is still a lot to find out about the avifauna of Palmarí. Whenever you go, I recommend a stay of at least a week to be able to bird all the different habitats properly. And don´t forget your rubber boots – you will need them! I hope that these descriptions will be valuable both when planning a trip to Palmarí and as a reference while at the lodge. Birding in/from the lodge and enramada clearings can be very rewarding, especially when trees are flowering or fruiting. Even if your time at the lodge is limited and most special birds are found inside the forest, it can definitely pay off to look around for a hummer tree. The extraordinary Fiery Topaz is more likely to see here than anywhere else, as long as their favourite tree with red tubular flowers is in bloom. Some luck is required, though, as it takes a week or two for the flowers to open. Other good hummers seen in the lodge clearing were Black-bellied Thorntail and Gould´s Jewelfront. A species I only saw at fruiting trees in the clearings and never inside the forest was Striped Manakin. Deville´s Parakeet is commonly seen or heard daily in the clearings. The observation tower serves as a good viewing point for raptors, parrots and swifts, as well as riverine species. Unfortunately there is very limited space, enough only for one telescope. All kinds of birds turned up here during my 7 weeks, including species like Amazonian Umbrellabird, Pied Puffbird and Opal-rumped Tanager. At dusk, a few Band-tailed Nighthawks can usually be seen hawking over the river, although they may be easier to watch from the porch in front of the restaurant. At the river´s edge there are strings of trees and bushes, and grass, where various várzea and scrub species can be seen, including Speckled Chachalaca, Spot-breasted Woodpecker, Straight-billed and occasionally Zimmer´s Woodcreeper, Barred Antshrike, Olive-faced Flatbill, Spotted Tody-Flycatcher, Várzea Schiffornis, Gray-chested Greenlet, Hooded Tanager and various Seedeaters. Many of the austral migrants also frequent these habitats, including Large and Small-billed Elaenias, Vermilion Flycatcher and Crowned Slaty-Flycatcher. The water level of the river drops dramatically in August-September, creating tall river banks, huge sandy beaches and, just in front of the lodge, a “peninsula” covered in tall grass and shrubs with a few patches of trees. Add to this muddy beaches, and you´ve got a whole new set of habitats for birds. At the peak of low water you can even walk into the peculiar, low igapó forest and walk the Piranha trail (see below). I spent quite a few afternoons and a couple of mornings birding these habitats, at the beginning from a canoe. I had reason to believe that one of the new species was to be found here, which turned out to be wrong. Instead I found several other interesting and surprising species, and I thoroughly enjoyed watching Nearctic waders at close range. My surprise birds were Lesser Wagtail-Tyrant and Plain Tyrannulet, both seen very well and comprising extralimital records to what was previously known about their ranges. Among the species regularly found around the peninsula can be mentioned Muscovy Duck, Lesser Yellow-headed Vulture, Great Black-Hawk, Gray-breasted Crake (frequently heard, but almost impossible to see), Purple Gallinule, Large-billed and Yellow-billed Terns, Pectoral and Solitary Sandpipers, Collared Plover, Wattled Jacana, Pale-vented Pigeon, Ruddy Ground-Dove, White-tipped Dove, Deville´s Parakeet, Ladder-tailed Nightjar, Rusty-backed Spinetail, Mouse-colored Tyrannulet, Red-capped Cardinal, Yellow-hooded Blackbird and Giant Cowbird. The birding around the peninsula is dynamic. After some heavy rains in late August and early September the peninsula was suddenly full of Greater Anis and Fork-tailed Flycatchers. The muddy shores were graced by single visits by Stilt and Buff-breasted Sandpipers, Greater Yellowlegs and Pied Lapwing. Just behind the lodge there is a system of trails that are all connected to the Yellow trail, the principal terra firme trail of Palmarí. I will deal mostly with the Yellow trail itself, and write more briefly about the others. More or less common species that can be seen or heard anywhere in the area are i.e. Variegated and Cinereous Tinamous, Needle-billed Hermit, Pavonine Quetzal, Amazonian White-tailed Trogon, Black-spotted Barbet, Juruá Woodcreeper, Saturnine Antshrike, Stipple-throated, Long-winged, Gray and Pygmy Antwrens, Double-banded Pygmy-Tyrant, Dwarf Tyrant-Manakin, Dusky-capped Greenlet and Slate-colored Grosbeak. a) The Yellow trail is the principal terra firme trail of Palmarí, traversing both flat areas and hills, with a few minor creek crossings and a stretch beside the Cachoeira stream. In other words it´s varied and also has a very good selection of terra firme birds. The trail is marked with meter signs. Interesting birds can be found as soon as you step into the forest, but normally it´s rather quiet until you get to the stream at around 200 m. Spot-backed Antbird is regular here, and Hairy-crested Antbird, White-shouldered Antshrike and Red-crowned Ant-Tanager are all possible but highly irregular. At 300 m there is a tree fall where Black Antbird can be found. From here to 600 m watch and listen for Brownish Twistwing, Blue-crowned Manakin and Grayish Mourner. My only Ringed Antpipit was seen here. At 600 m the trail starts climbing a hill, and it follows the ridge top until 1450 m. This is a very good stretch for species like Mouse-colored Antshrike, Sooty, Slate-colored, Yellow-browed and Scale-backed Antbirds, Chestnut-belted Gnateater, Thrush-like Schiffornis, Blue-backed Manakin, Citron-bellied Attila (esp. 600-650 m), White-crested Spadebill, Rufous-tailed Flatbill and Tawny-crowned Greenlet. A pair of Yellow-throated Woodpeckers had their nest at the Guayaba intersection (see species list). Canopy flocks might hold Chestnut-winged Hookbill, Eastern Woodhaunter, Rufous-tailed Xenops, Sclater´s and Chestnut-shouldered Antwrens, Eastern Sirystes and different tanagers. Rarer species might include Great Jacamar, Rusty-breasted Nunlet, Black-banded Woodcreeper and Short-tailed Leaftosser. At c.1500 m the trail goes downhill and then up and down a ridge. On the top you can take the left onto the “Tractor” trail (e). If continuing down from the ridge you pass a swampy area and soon reach the Cachoeira stream. The trail goes along here until c. 2800 m. Regular species here are i.e. Scale-breasted Woodpecker, Cinnamon-throated Woodcreeper, Plain-winged and Spot-winged Antshrikes, Black, Southern Chestnut-tailed, Sooty and Spot-backed Antbirds, Rusty-belted Tapaculo, Bright-rumped Attila, Screaming Piha, Wing-barred Piprites and White-crowned Manakin. Look out for Brown-banded Puffbird (high up! ), Broad-billed Motmot, Ihering´s Antwren, Spot-winged Antbird, Amazonian Royal-Flycatcher, Yellow-throated Flycatcher (voice), Cinereous Mourner and Buff-rumped Warbler. I saw Starred Wood-Quail once, and there are older records of Bar-bellied Woodcreeper. At the “cachoeira” the Yellow trail continues along the stream, while a left turn will take you on the Cachoeira trail to the lodge. After a few hundred meters you enter the plantations of Palmarí community, and you can continue through the village to complete the circuit or turn back and take the Cachoeira trail. b) The Cachoeira trail is short, passing a steep ridge. It is good for motmots (in the beginning) and in the occasional flock, look especially for Ihering´s Antwren. It´s more convenient to take this trail to complete the Yellow trail, instead of going through the community. c) The short Canopy trail leads to the Canopy platform (d), mostly gently uphill. This is a good trail for Southern Nightingale-Wren and Citron-bellied Attila. d) I only “climbed” to the Canopy platform once. The platform has been built by and is visited only with the staff of Selvaventura, an independent partner to Palmarí lodge. The cost is 50.000.- colombian pesos or 50.- reales/person and climb. It´s a small platform but the view from here is very good. It´s a shame that I didn´t get up here more times. During my only visit I saw goodies like Black Hawk-Eagle, Brown-banded Puffbird, Purplish Jacamar, Black-bellied Cuckoo and Spangled Cotinga. A few species rarely seen from the ground are very likely regular from up here. e) The “Tractor” trail was usually kind of quiet, but here I found good understorey flocks several times, with species like Ihering´s Antwren, Wing-barred Piprites and White-crowned Manakin. Chestnut-belted Gnateater was seen once. A long terra firme trail, some 6-7 km in length. Most of the trail is on fairly level ground, the trail itself is partly an old logging track. Although this trail always felt a bit on the quiet side, there are some good birds around, notably Rufous-necked Puffbird (seen twice), Blue-cheeked Jacamar, Golden-green Woodpecker, White-shouldered Antshrike, Sclater´s Antwren, Slate-colored and Yellow-browed Antbirds, Chestnut-belted Gnateater, Rusty-belted Tapaculo, Cinereous Mourner and White-crowned Manakin. 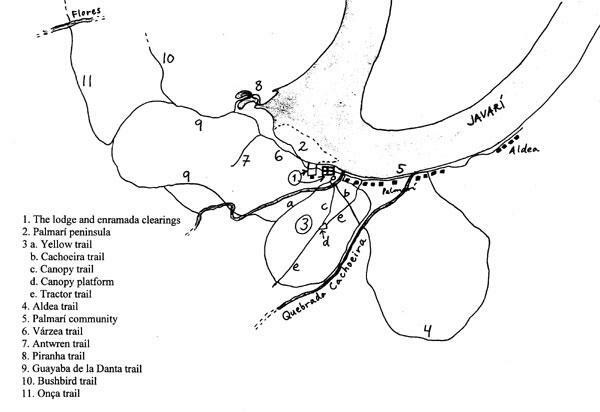 A good trail for both Saddle-backed and Black-chested Moustached Tamarins. A walk through the community of Palmarí can give some different birds of forest edge and secondary growth. Flowering and fruiting trees different from the ones in the lodge clearing are found, and can be full with hummingbirds and tanagers. Needle-billed Hermits, White-necked Jacobins and Purple Honeycreepers were seen under the very best of circumstances. Mauritia palms probably hold Sulphury Flycatchers, although I didn´t find any during my few walks through the village. White-shouldered Antbird, less common on the Brazilian side of the Javarí, was heard on two occasions toward Aldea, and the plantations may yield austral migrants and a variety of seedeaters. One of my favourite trails, at the very edge between várzea and terra firme. The varied habitats make this trail very species rich and some of the flocks I saw here were truly spectacular. First you cross the Enramada clearing. When entering the varzéa there is an open water space immediately to your right (during low water season – the trail may not be walkable at all in June, and certainly not during high water levels). In this area I found i.e. Muscovy Duck, White-chinned Jacamar, Chestnut-capped Nunlet, Amazonian Antshrike, Band-tailed Antbird, Leaden Antwren, Olive-faced and Yellow-olive Flatbills, Cinnamon Attila, Lesser Kiskadee and Chestnut-crowned Becard. Anywhere ahead of you a flock may turn up, which could hold species like Speckled Spinetail, Rufous-tailed and Slender-billed Xenopses, Ocellated, Striped and Plain-brown Woodcreepers, Sclater´s, Dot-winged and Chestnut-shouldered Antwrens, Gray-crowned Flatbill, Sepia-capped Flycatcher, Long-billed Gnatwren, Lemon-chested Greenlet, Rufous-bellied and White-lored Euphonias, Paradise Tanager and White-winged Shrike-Tanager. After about 700 meters you reach a stream crossing. Along this stream is a Gray Wren held territory. It was mostly heard near the end of the trail, but was seen close to here by the Fieldguides group. The final stretch of the trail goes at the edge of the terra firme, but it´s easy to walk beside the stream below if you want to. Johannes´s Tody-Tyrant and Amazonian Streaked-Antwren was often heard from here. Many more or less rare species turned up along the trail during my many walks, most notably a Buckley´s Forest-Falcon which was heard calling one morning. Among others can be mentioned Rufescent Tiger-Heron, Gray-headed Kite (nicely perched! ), Spix´s Guan, Black-bellied Thorntail, Blue-chinned Sapphire, Curve-billed Scythebill, Silvered Antbird, Amazonian Royal-Flycatcher (heard), Amazonian Umbrellabird, Lawrence´s Thrush, Guira Tanager and Band-tailed Oropendola. A short side trail connected to the Várzea trail, going up alongside a stream of a terra firme slope. I have named it “Antwren trail” because there always seems to be an understorey flock around, with plenty of Stipple-throated and Long-winged Antwrens. Species of note on this trail are Black-throated Trogon, Great Jacamar, Cinnamon-rumped Foliage-gleaner, Southern Nightingale-Wren and Wing-barred Piprites. It is possible to walk this short trail only during very low water levels, when you can reach it via the peninsula or the next coming trail, Guayaba de la Danta. The habitats are várzea, igapó and the two Piranha lakes. If the water level is high, you can still see most species from a canoe. Birds are much the same as along the várzea trail and the peninsula, but here the possibilities are much better to see waterbound species like Green and Pygmy Kingfishers, Band-tailed Antbird, Amazonian Streaked and Leaden Antwrens or an occasional Black-collared Hawk. Flocks here may include Ocellated, Striped and Zimmer´s Woodcreepers, Slender-billed Xenops, Amazonian Antshrike, Wire-tailed Manakin and White-vented Euphonia. The Gray Wren holding territory along the Várzea trail could be heard from here as well, and my only Black-and-white Hawk-Eagle was seen briefly overhead. This is, in my opinion, the best and most varied of the terra firme trails. To walk the full length (c. 6 km including the Várzea trail) you need to be in fairly good shape, since it´s a bit on the rough side, with many stream crossings. Ideal is to walk this trail twice, starting at different ends. Starting at the end of the Várzea trail, you first enter transitional forest which can be quite wet after heavy rains. After a few hundred meters the trail starts to climb gently up a slope until it levels out at c. 1000 meters. At 2000 meters the trail climbs up to the top of a ridge and then down at 2800 meters to a marshy, low-lying area with numerous stream crossings. A ridge is crossed at 3900 m, and at 4236 meters the trail end up with the Yellow trail (800 m). The first 1.5 kilometers can be quite birdy. There are often flocks around, and this was one of the few places where I had good army ant swarms. Add to this a good selection of skulkers, and you´ve got a really good mix of species. Regular species here includes White-throated Tinamou, White-fronted Nunbird, Golden-collared Toucanet, Yellow-throated, Golden-green and Red-necked Woodpeckers, Mouse-colored Antshrike, White-throated, Scale-backed and Hairy-crested Antbirds, Black-faced Antthrush, Thrush-like Antpitta, Chestnut-belted Gnateater, Rusty-belted Tapaculo, Rufous-tailed Flatbill, Brownish Twistwing, Black-capped and Pink-throated Becards, White-crowned and Red-headed Manakins, Purple-necked Fruitcrow, White-necked Thrush and Fulvous-crested Tanager. Among the many species seen occasionally can be mentioned Lined Forest-Falcon, Spix´s Guan, Starred Wood-Quail, Black-throated Hermit, Rufous-necked Puffbird, Paradise Jacamar, Short-billed Leaftosser, Amazonian Barred-Woodcreeper, McConnell´s Flycatcher, White-bellied Tody-Tyrant, White-crested Spadebill and Citron-bellied Attila. Among the birds that I found between 1500 and 2100 m the Reddish-winged Bare-eye is outstanding, but worth to mention are also Rusty-breasted Nunlet, Chestnut-winged Foliage-gleaner, Eastern Woodhaunter, Amazonian Barred-Woodcreeper, Slate-colored and Black-faced Antbirds, Plain-throated Antwren and Curl-crested Aracari. Every time I walked on the ridge (2100-2800 m) it was late morning and more or less quiet except for some occasional small flock. The marshy/streamy area between 2900-3700 m hold many good species and very nice canopy flocks. Birds to look for here are Little Tinamou, Pale-tailed Barbthroat, Rufous-tailed Xenops, Chestnut-winged Foliage-gleaner, Spot-throated and Long-tailed Woodcreepers, Black Bushbird, Sclater´s and Chestnut-shouldered Antwrens, Spot-winged and Sooty Antbirds, Ash-throated Gnateater, Slaty-capped Shrike-Vireo and various Tanagers. Along the few hundred meters left before the Guayaba reaches the Yellow trail, I found goodies as Purplish Jacamar, Short-billed Leaftosser and Undulated Antshrike on single occasions. A seldom used side trail to the Guayaba de la Danta. I only walked it once, and my guide Socó had to use his machete quite a lot. The trail goes through a lot of marshy areas with thick understorey, eventually climbing a hill. There we turned around, but it continues for yet quite a while. As one might guess from the name I´ve given the trail, I had Black Bushbird here, a pair, in an area of tall heliconias. I wouldn´t be surprised if there are several pairs along the trail, because there is a lot of suitable habitat. Good for Spot-backed, Sooty and White-throated Antbirds. Other species of note were Lined Forest-Falcon (heard), Gould´s Jewelfront, Spotted Puffbird and Cinereous Mourner. This trail is a long, long one. It is a 3 days/2 nights walk to/from Onça lake (reachable by boat up-stream from the lodge, following the “Zacanbuzinho” channell and into “Christina” lake further to “Onça” lake), and from here you can continue another 3 days to Socó lake! Doubtless many interesting discoveries could await those willing to make this special effort. I didn´t walk longer than about 2 kilometers, to Flores, a major stream. I had planned to go here more times, but the wet conditions after heavy rains prevented me. Anyway, I had several good birds here, and I recommend it to those in a decent physical condition that are staying for a while. It´s almost 10 kilometers to Flores, there and back. The first stretch of the trail crosses ridges and swampy areas and has been selectively logged, but the forest is nearly pristine. Among the species I recorded here can be mentioned Lined Forest-Falcon, Black-bellied Cuckoo, Blue-cheeked Jacamar, Rufous-necked Puffbird, Curl-crested Aracari, Golden-collared Toucanet, Red-necked Woodpecker, Black-tailed Leaftosser, Strong-billed and Lineated Woodcreepers, Slate-colored Antbird, White-necked Thrush and Yellow-crested Tanager. A nice and birdy trail of várzea and transitional forest. The beginning of the trail can be very wet and muddy after rains, but after a few hundred meters it gets better. After a kilometer or so you reach a plantation. The trail continues, actually all the way to Palmarí, but I didn´t walk that much farther. Among the specialties here can be mentioned Blue-crowned Trogon, Blue-cheeked and Paradise Jacamars, Chestnut-capped Puffbird, Rufous-tailed Antwren, Dot-backed Antbird, Black-spotted Bare-eye,Yellow-crowned Elaenia, Johannes´s and Snethlage´s Tody-Tyrants, Euler´s and Dusky-chested Flycatchers, Wire-tailed Manakin, Purple-necked Fruitcrow, Gray Wren, Hauxwell´s Thrush, Gray-headed Tanager and Fulvous-crested Tanager. Río Suno Antwren and Black-tailed Antbird should be looked for. 2. "Zacanbuzinho" channel & lake "Cristina"
Only visited twice, both times with the Fieldguides group. Anyway, this is a very nice area. Zacanbuzinho is a long blackwater channel connecting three lakes. Selvaventura has a canopy platform here, where one can stay over night (100.000.- colombian pesos or 100.- brasilian reales). We cruised slowly along the channel and walked randomly in the forest by Lake Cristina. Several excellent species were recorded, including Slate-colored Hawk, Red-throated Caracara, Band-tailed Nighthawk (40+!) Blue-chinned Sapphire, Green-and-rufous Kingfisher, Pied Puffbird, Silvered and Band-tailed Antbirds, Amazonian Black-Tyrant, Johannes´s and Snethlage´s Tody-Tyrants, Cinereous Becard and Amazonian Umbrella-bird (6 males!). The first records of Buckley´s Forest-Falcon and White-chested Swift for Brazil were made in this area (and I found them again at different places!). This trail, starting in the village of Santa Rita and at times going all the way to Lake San Antonio, has várzea that does not get flooded every year - a kind of transitional forest. Several species were seen only here, among those such goodies as Black-tailed Antbird (at a marshy depression just 100 meters from the forest edge) and Río Suno Antwren, Black Bushbird, Dot-backed Antbird, Golden-crested Spadebill, Chestnut-rumped Foliage-gleaner, Blue-chinned Sapphire, Cream-colored Woodpecker, Rufous-necked Puffbird, White-chinned Jacamar and Wire-tailed Manakin. I only walked this trail once, and even if it felt a bit quiet at times I found quite a few good birds in the end. The “traditional” trail going to the blackwater lake Mata-Matá is rather short, but two new canopy platforms were constructed by Bluefields while I was there, extending this trail quite a bit in length. Birding from these platforms could prove to be great (Harpy Eagle was seen at close range during the construction)! Among the species that I recorded can be mentioned Green Ibis, Slate-colored Hawk, Lesser Swallow-tailed Swift, Spotted Puffbird, Yellow-throated Woodpecker, White-shouldered, Plumbeous and Silvered Antbirds, Snethlage´s Tody-Tyrant, Amazonian Royal-Flycatcher, Cinnamon Attila, Hauxwell´s Thrush and White-shouldered Tanager. Río Suno Antwren and Black-tailed Antbird are both very likely to occur here. Arrumadeiro is a small lake surrounded by excellent várzea forest. The margins of the lake and its outlet have rather extensive grass and scrub, creating a habitat that is not found at the much more numerous blackwater lake systems. A trail goes all around the lake, though the best part is probably on the right hand side. The major tourist attraction at Arrumadeiro is a healthy but irregular population of Hoatzin. I only saw the species on one occasion, but the flock of c. 35 individuals was quite impressing! During times of favourable water levels, decent numbers of egrets and waders might be found. Horned Screamer and Muscovy Duck are both regular. Among the many specialties of the area can be mentioned Plumbeous Kite (sometimes in huge flocks! ), Tui Parakeet, Reddish Hermit, White-chinned Sapphire, Collared Trogon, Cream-colored Woodpecker, Spotted Puffbird, Rufous-capped Nunlet, Scarlet-crowned and Lemon-throated Barbets, Plain-crowned, Speckled and Rusty-backed Spinetails, Ocellated, Striped and Zimmer´s Woodcreepers, Great, Barred and Amazonian Antshrikes, White-browed, Black-throated and Plumbeous Antbirds, Yellow-crowned Elaenia, Amazonian Royal-Flycatcher, Black-tailed Tityra, Gray-chested Greenlet, Tropical Gnatcatcher and White-shouldered Tanager. Purple-throated Cotinga was seen by Fieldguides and both Wattled Curassow and Harpy Eagle have been seen by the local guides. I visited this blackwater lake once with Axel and an Australian, staying overnight. It was mainly a fishing trip with limited birding, but I think that several interesting species could be found here. Birds of note on my visit: Slate-colored Hawk, Bat Falcon, Tawny-bellied Screech-Owl, Spectacled Owl, Common Potoo, Long-billed Woodcreeper, Leaden Antwren and a very probable Gray Wren singing briefly. Onça area Lake Onça is a part of the Zacanbuzinho water system. I´m not familiar with the lake itself, but it´s right on the edge to the terra firme. As already written under the description of the Onça trail, this area is connected to both Palmarí and the following area, Socó. Even if you don´t make the 2-3 day long hikes, the area is virtually ornithologically unknown and could turn up nice surprises. Socó area A long channel leads to this pristine area, probably one of the best places reasonably close to Palmarí. I had planned to go there, but I blew it. Hunters do not get into this area, therefore Wattled Curassow is a quite reliable possibility. Harpy Eagle has been seen several times and probably breeds in the area. The terra firme trail that connects Socó with Onça and Palmarí could be really interesting.